Here is a very interesting case from Pennsylvania, where the definition of “normal working conditions” is fraught with terror (and which, as a result, closes the door to comp compensability while potentially opening another to lawsuits). But in our excitement to discuss this intriguing case, we get ahead of ourselves. Greg Kochanowicz worked as a manager for the Pennsylvania Liquor Control Board. That might sound like an enforcement job, but ironically, his job was selling liquor from a retail outlet. On April 28, 2008, a masked man entered the store, pointed two guns at Greg and a co-worker, and forced them to empty the safe and cash register. The robber prodded the back of Greg’s head with one of the guns. After getting the cash, the robber used duct tape to tie Greg and his co-worker to chairs in the office. There was no physical harm – just the threat of violence if Greg did not cooperate. Greg’s employer appealed the WCJ ruling. A split panel of judges (4-3) reversed the finding of compensability on the basis that armed robberies were a “normal” working condition – and only “abnormal” working conditions lead to compensability for PTSD/”psychic” injuries. That’s a very interesting notion, indeed. In its reversal, the appeals court noted that robberies were quite common among the Liquor Control Board stores: in the five county area, there were 99 robberies since 2002, an average of one a month. In addition, employees were acutely aware of the risks. They received a written pamphlet entitled “Things you should know about armed robbery.” Greg had read the booklet and received training related to it. In fact, he followed the employer’s written protocol to the letter, thereby avoiding bodily harm to himself and his co-worker. The appeals court states that having a gun pressed to the back of the head is a “normal” working condition. If this is indeed true, then the employer has put employees in a workplace that is fraught with risk. This is something employers are not allowed to do. If the court is correct, if armed robberies are a “normal” working condition, then the employer has failed to eliminate an unacceptable risk. By leaving unarmed employees in high risk areas, they are out of compliance with OSHA standards. Given their knowledge of the likelihood of robberies, they should place armed guards in each store, particularly in evening hours. Their failure to protect employees from an all-too-routine hazard is unacceptable and may be grounds for lawsuits. This case is wending its way toward the PA Supreme Court, where the arguments of the dissenting judges, led by Renee Cohn Jubelirer, are likely to prevail. Greg will probably qualify once again for workers comp. Yes, he received training in violence; he was well aware of the risks in his job; he even handled the situation with exemplary composure. But there is nothing normal about having a gun pressed into the back of your head, unless you are an actor taping a cop show for cable TV. Health Wonk Review – John Irvine & Matthew Holt host a hefty edition of Health Wonk Review over at The Health Care Blog – lots of good health wonkery there! Illinois work comp reform – After all the sturm und drang in the Illinois reform process, we’ve had a breakthrough … a reform bill finally passed on the last day of the legislative session. In a Tale of Persuasion, AP’s Zachary Colman takes you step by step through the painful process. And at Managed Care Matters, Joe Paduda offers an excellent rundown of some of the key provisions in the Illinois work comp reform bill. In other Illinois news, the matter of $10 million in repetitive stress claims filed by Menard County prison guards has taken some new twists. The Illinois house recently passed a bill requiring the release of the related workers’ comp test records in compliance with the Freedom of Information Act. A report obtained through the FOIA shows that locking and unlocking prison cells didn’t injure the guards. Missouri’s second injury fund woes – Injured workers in Missouri are being left in the lurch, according to a story in stltoday.com. about the state’s troubled Second Injury Fund Roberto Ceniceros posts more about Missouri’s financially-ill second injury fund. Workplace violence factors – The Workplace Violence Blog posts about the prevalence of workplace violence as evidenced by a Society of Human Resource Management survey, and states that “Approximately $55 billion a year is lost to litigation awards, property damage and lost productivity from workplace violence. It is estimated that productivity can drop as much as 50% in the six to eight weeks following a workplace violence incident.” The post includes seven common organizational factors that contribute tow workplace violence. MRSA facts from the CDC – From the CDC, MRSA and the workplace, including a list of frequently asked questions. Staph infections, including antibiotic resistant MRSA, MRSA skin infections can occur anywhere. However, the CDC notes that some settings have factors that make it easier for MRSA to be transmitted. These factors, referred to as the 5 C’s, are as follows: Crowding, frequent skin-to-skin Contact, Compromised skin (i.e., cuts or abrasions), Contaminated items and surfaces, and lack of Cleanliness. Locations where the 5 C’s are common include schools, dormitories, military barracks, households, correctional facilities, and daycare centers. In yesterday’s blog on this topic, we told the story of a pizza delivery driver whose undisclosed seizure problem put others (and herself) at risk. Today we examine the inordinate and ultimately terrifying risks that routinely confront the people who deliver pizzas to homes. The risks of delivery jobs are embodied in one sad tale. Richel Nova, 58, was a hard working immigrant who worked two jobs, one being delivering pizzas for Domino’s in Boston. He responded to a call from the Hyde Park neighborhood. The address was a vacant home. He was lured into the house, robbed, stabbed multiple times and left for dead. The three thieves took his money ($100) along with the pizza and drove off in his 1995 Subaru. (The age of the car tells us a lot about Mr. Nova.) The abandoned car was found a bit later, along with the blood-stained pizza box. All but three pieces had been eaten. Nova’s life revolved around his family: twin 20-year-old daughters and an older son. The twins are both juniors in college. All that stood between Nova and a seat at his daughters’s graduation next year were a hundred bucks and a pizza to go. Robberies of delivery people in the Boston area have been a long-standing problem – 52 were reported through mid-September. The three main pizza chains – Domino’s, Pizza Hut and Little Caesar’s – have collaborated on developing safety programs for drivers. Among them, they have nearly 90,000 drivers on the road. (Here is the Domino’s description of the job.) Statistically, it’s not difficult to identify the riskiest neighborhoods for delivery, but the chains face pressure from neighborhood groups and the federal government to provide delivery services without discriminating against the poor. For those of us who have never had a gun or knife thrust into our faces, the dangers confronting delivery workers every day are both frightening and unimaginable. For Richal Nova’s children, any mention of pizza will haunt their thoughts for the rest of their lives – reminding them of their father’s lonely and senseless demise at the hands of cruel thugs with a half-baked plan for a free meal. Joe Paduda is the man of the moment. 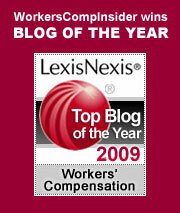 His Managed Care Matters blog is worth a regular perusal for the informed commentary he offers about the medical side of workers comp. Today, there’s twice as much reason to visit because he’s the host of this week’s Health Wonk Review, in which the focus is on implementing health care reform. Check out this biweekly best of the health policy blogosphere! In another corner of the world, other workers were homicide victims. The New York Times offers a tribute to 10 medical workers who were killed while on a mission to provide aid to remote Afghanistan villages that generally don’t have access to medical care. Workers included 6 U.S. medical personnel and humanitarian workers, one German, one Briton and two Afghans. Popcorn Lung – Richard Bales of Workplace Prof Blog posts that an Illinois jury has awarded $30.4 million to a plant worker suffering severe lung disease from diacetyl. See more from on the popcorn lung case from the Joplin Globe. Liz Borowski of The Pump Handle reminds us that before BP became synonymous with the Gulf oil disaster, it’s prior “claim to fame” was the 2005 Texas City refinery disaster that killed 15 workers. When OSHA conducted a 2009 follow-up investigation, it issued $50.6 million in failure-to-abate citations, plus $30.7 million for 439 new willful violations it identified. BP had disputed these violations, but last week, agreed to pay the entire $50.6 million. Yesterday was a day of remembrance for the victims of last week’s horrifying shootings at Hartford Distributors in Connecticut – our hearts go out to the family, friends, and coworkers of the deceased. Their lives will be forever changed and imprinted by this terrible event. Omar Thornton’s murderous acts left eight coworkers dead and two grievously wounded. The horrifying massacre brought to mind another racially-motivated workplace-based mass murder, the 2003 shooting at a Lockheed Martin plant in Meridian, Miss., which left 6 dead and 8 wounded. Unlike last week’s shooting for which there were few if any advance clues or hints, the killer in Meridian had left a trail of violent threats and behaviors. Many who knew or had worked with Doug Williams feared and even predicted that his threats would culminate in some terrible event. Whether racism was a trigger in the Connecticut case or not seems a moot point. Even if it were true that racism occurred, as alleged by the family of the shooter, that would not justify such a heinous and wildly disproportionate reaction. Company and union officials deny the allegations of racism and say that no such grievances had been filed or were on record. Yet Thornton’s call and the allegations will likely play a factor as lawyers for the victims seek damages. If victims seek any redress beyond workers compensation, they will face a high hurdle. When litigation is successful at piercing the exclusive remedy shield, it often involves employer misconduct that is highly egregious. We noted then and note again now that, while often an imperfect and unsatisfying system, workers comp generally holds up as the exclusive remedy in such cases. Can employers inoculate against such events? While most workplace risk can be managed and risk mitigation strategies can be adopted to eliminate or minimize hazards, when it comes to the human heart and mind, preventive strategies can be less certain. There are certainly best practices that can be put in place, predictive profiles and warning indicators that can be consulted, and good hiring and supervisory practices that can be enacted. “Despite all the guidance and advice that can be given, the awful truth is that there really is no way to prevent tragedies like this from ever occurring. An employer can do everything “right” and yet still a rampage ensues by someone committed to carrying out a terrible crime. That’s not to say that employers should ignore the issue; they shouldn’t. But we also should be careful not to draw conclusions from an incident like this too.